A review in 10 words (or thereabouts): A town of exceptional puns and a job, that literally, kills. Goodreads sums this one up pretty nicely. 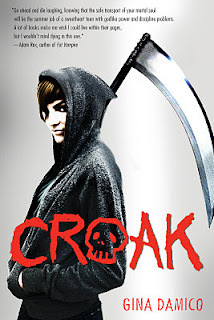 Lex is expecting a torturous summer milking cows on her Uncle Mort's farm, but surprising, finds that there are no cows to be seen in the VERY small town of Croak. She's a reaper, just like her uncle, and has been given the task of retrieving the souls of the recently deceased so that they may live peacefully in the afterlife. It just so happens she's a natural, but when she is sent to retrieve the soul of a young girl who has recently been murdered, she discovers that with power comes great responsibility. Unfortunately for Lex, someone else has provenance in mind as well. I mentioned the puns, didn't I? The town is called "Croak." The gym is called "Dead Weight;" They eat at "The Morgue;" and there are establishments called "Big Sleep," "Bucket Kickers," and "Pushing Daisies." Kills me. Beside the genius wordplay, Lex is a spitfire. She's sassy, speaks her mind, quick with comebacks, fiercely determined, and tough as nails. Sure, you want to throttle her occasionally, but that's normal. She's a teenage girl. And even though she's terribly stubborn, she undergoes a genuine transformation throughout the book, one I'm very eager to see continue throughout the series. The book would be traveling along at a steady pace, and then, all of a sudden, characters would make certain assumptions that would send the story propelling forward. One scene in-particular caught me off guard, leading me to read it a couple of times to determine if I'd skipped over a few pages accidentally. Overall, an extremely entertaining read. I was pleasantly surprised when the book didn't take the turn I thought it was destined to take. Damico spins the story in a new, refreshing direction (if you can call it that...there are, alas, lots of dead people about) and really builds a conundrum for Lex and the friends she makes in Croak. The dialogue is spectacular, the conversation witty yet realistic, and the town so very interesting that I would love to visit, alive of course. So very different than the paranormal romances flooding the market. Here's a supernatural story that's both clever and thrilling, stock full of characters that you'll absolutely adore. OH! And super cool...props to the VOYA blurb on the back! A fellow blogger (Superlibrarianblog.com) and former coworker wrote that review!